This workshop is for Grasshopper intermediate/advanced users and developers who already have a basic understanding of RhinoCommon and building simple Grasshopper plug-ins. The first two days of the workshop will focus on a variety of intermediate and advanced topics, such as improving performance and efficiency. During the final two days, participants will have the opportunity to develop their own project in 1:1 sessions with the instructor. On Thursday, two of our McNeel developers in Barcelona will introduce McNeel's latest projects Rhino Inside and Rhino Compute. ScriptSync: Using Visual Studio as a replacement C# Code Editor in Grasshopper. Custom graphics display (custom colors, materials, styles). Programmatically interacting with Rhino modeling environment from Grasshopper (including geometry baking). Understanding Grasshopper wrappers for RhinoCommon geometries. Working with Grasshopper data trees. 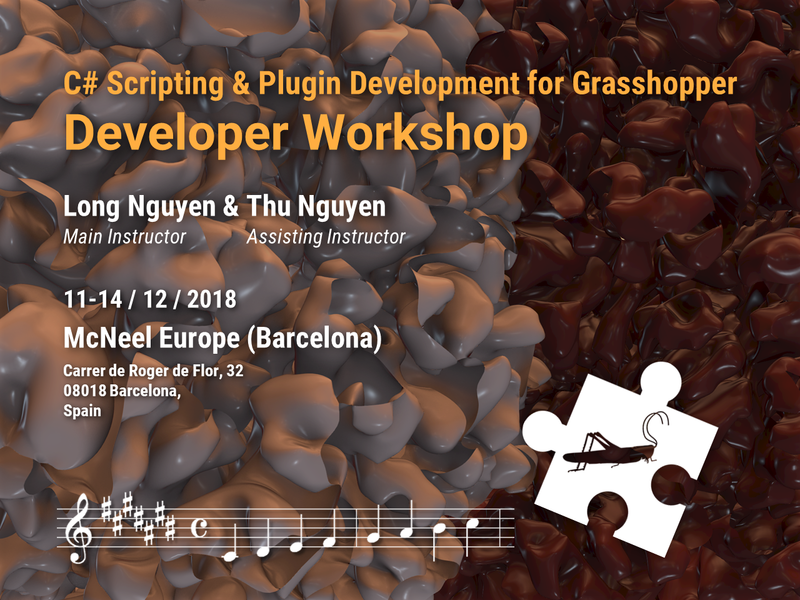 Good practices for making your Grasshopper plug-in accessible from within the C# Script and Python script components. C# delegates and anonymous functions. Parallel computation with the .NET Task Parallel Library. Full-time students and university teachers (proof of status required) will get a 50% discount. Remote attendees have the chance to attend this course during the first two days for EUR 265,- (+VAT). Please note your seat is only confirmed once payment has been cleared. Max. Number of Participants: 10 participants, 5 remote attendees. If there is no quorum, the course will be canceled 15 days before (November 26). Educational seats are limited. To sign up now contact McNeel Europe!